Around the world, the trend to explore a plant-based diet continues to gain traction. Although there has been a 600 percent increase in people identifying as vegans in the U.S in the last three years, according to research firm GlobalData, more consumers are what some may call “plant curious,” opting for small changes like participating in Meatless Monday. And companies are picking up on this trend, with major brands like Nestlé deeming plant-based one of the six trends it hopes will deliver industry growth. Now, one of the major players in the quick service restaurant (QSR) space is taking the plunge, offering a plant-based menu option to appeal to vegans and meat-eaters alike. In an interview with CNN, Chris Finazzo, president of Burger King North America, stated he hopes the Impossible Burger will “give somebody who wants to eat a burger every day, but doesn't necessarily want to eat beef everyday, permission to come into the restaurants more frequently.” And this is in alignment with market trends. A recent study by research firm Kantar found 92 percent of plant-based meals consumed in the U.K. in 2018 were eaten by non-vegans, with around 22 million people identifying as “flexitarian.” To start, Burger King is rolling out the Impossible Whopper in 59 stores around St. Louis, with additional stores being added over time. Although Burger King’s move allows it to appeal to a broader market of vegans, vegetarians and “plant curious” consumers alike, it also has the potential to create an environmental ripple effect. 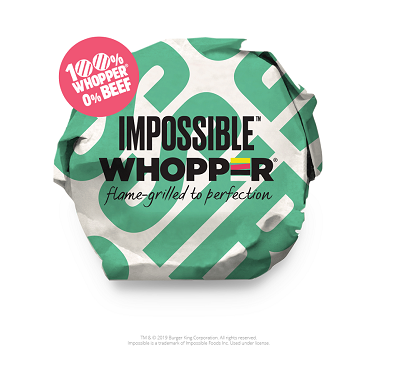 If Burger King fans even occasionally opt to switch to the Impossible Whopper, the impacts could be great – with the U.N. estimating the meat industry generates nearly one-fifth of the man-made greenhouse gas emissions that accelerate climate change. And if the trend continues to gain traction, we should see more companies innovating their product offerings to keep up with changing consumer demands, while creating positive environmental benefits.